I’m the kind of person that likes to go go go. When writing, I prefer to power straight through projects rather than do it little by little. For the most part, this works out for me. I write a little each day, force myself to at least get through a good chunk of setting or dialouge on days that I just have no desire to write, and edit in any downtime. The rest of my time is then divided up into day-job work, sleeping when necessary, a scheduled amount of social time, then plenty of reading and promoting my current works. I like to be busy. I take pride in being busy. Even then, it’s good for me to take little breaks now and again. For me, a break period never goes beyond a month if I really need a breather. More often it tends to be a period of about two to three weeks. With the exception of jotting down a couple notes so I don’t forget about crucial brain-babies, I refuse to pick up a pen for creative writing. I put my manuscript notebooks up on a high shelf so I don’t even look at them. I stall on printing out the manuscript that needs editing. The only thing I have access to are my poetry book and my notes- both of which I will not open without a really good reason. Since I’m the kind of person who needs to force herself to go on breaks, I still have to be productive somehow. I focus more on completing small, fun things. This can be powering through my book list and taking out more books from the library. This can be making a commitment to seeing one old friend a week, or having more get-togethers or girl’s nights for a couple weeks. At the moment, my break has taken the form of busting through all three Mass Effect games (happened to get a deal at GameStop where I got all three for fifteen bucks, whoo hoo, currently halfway through the second). I re-route my energy into these new goals so that I am capable of taking a break without neglecting my own mental health. Might not sound like the most common way to go about keeping myself at my mental peak, but I know how my own mind works. It needs to be constantly spinning or it begins to panic. When I take a break, I specifically do things that let my mind spin- but instead of having it spin on full speed, the way it does when I am actively creating something, I let it spin against itself, through accomplishing easier, pre-set tasks or re-acquainting myself with people I’m already familiar with. Accomplishments without too much challenge or with a much lower level of stress attached. And yes, I think all these mental hoops are worth jumping through. No matter how you get to them, breaks are beneficial. Even if the point of the break isn’t being restful or really even slowing down the pace of general productivity. When I take breaks, I take a huge step back from my current projects. I don’t let myself think about the projects I want to be working on (sometimes can’t be helped, but at least I try). I think about other things. I consume the works of others. I pick up on points of views that the people I haven’t seen in awhile have picked up in their own life journeys. I allow myself to enjoy the little, usually even pointless, achievements and train myself to be content with all those little things. This helps me to recenter my own perspective, as well as recharging my sense of purpose and happiness with my choice of career. So even for the super productive, going-all-the-time people like me, breaks are important. Whether it comes naturally or you have to schedule them, whether it entails lounging on a couch and marathoning Teen Wolf or getting out of the house and going dancing with your friends, they are crucial for your mental well-being, and thus beneficial for your dreams and aspirations. Make sure you’re taking them! How do you like to take your breaks, readers? For me, it’s too easy to get distracted and bogged down to be able to pull together the attention span necessary to finish an entire novel. Especially when I’m tip-tapping away at my computer. Why add another paragraph when I can update all my websites, check my Facebook, play my Sims, chat online, or make new graphics for my short stories for the umpteenth time? By the time I even get to thinking about the title, I’m whisked away by another article suggested by LinkedIn about how to ‘get a truckload of reviews on Amazon’ or ‘better reach out to your audience’ or ‘avoid those tropes you just put into your story less than five seconds ago’. I also am useless at newer technology. My phone is a calls-and-text-only flip phone, and I have the same iPod touch that was brand spanking new back when I was still in high school. Since I tend to use a method that involves typing up my chapters and uploading them to be beta read one at a time, I don’t have any files that I could just put up in that Cloud thing that I still don’t understand, it’d be a bit of a reach to be able to get writing done when I’m not in my house, glued to my monster of a laptop. So my solution to all this and more? I hand-write the first drafts of all my manuscripts, from short stories to the small novels all the way to the honking 100k plus projects that tend to take up more than four individual notebooks. (Thank goodness the Dollar Store sells these things, or I might be a bit in the hole with my material costs). I take my notebooks with me everywhere- when I’m out visiting my mum, when I go over to Monkey’s for the weekend, when I’m tanning out on my back porch, when I’m with the girls I nanny. The girls want to take a nap? Out comes the pen. Monkey needs to finish a project at work? Lucky me, so do I. Mum goes to get groceries? That’s enough time for a page, right? Note that I say ‘notebooks’ as well- I have the one notebook that has the current manuscript-in-progress, as well as the smaller planning journal that contains character notes, look sheets, world-mythology and family trees, and three or four loose leaf pages of broad outlines that keep me on track with the goal of each chapter, as well as serving as my bookmark for where I currently am in the project. This first handwritten manuscript is full of strike-throughs, name-changes, notations to add details or new plot twists in the next version, small sketches and random people’s phone numbers/addresses. It’s messy to the point that sometimes I can’t read my own handwriting and I’ll soon have to pay for my fast-dying pens in blood in order to keep up with myself. With the amount of writing I do a day, it’s much more likely that I’ll develop some kind of carpal tunnel and if I lose my online files I will undoubtedly have to type up all of these chapters all over again (typing a chapter can take anywhere from 30min to a full hour depending on the length and how distracted I get). For all that, I’ve found that writing my manuscripts by hand has done worlds for knocking out my occasional periods of writer’s block. It also gives me something tangible to hold on to while I’m writing, which can be better for my thought process when I’m looking to go back and edit a certain section or change something entirely. It gives me an extra edit- when I type these chapters up, I’m technically already moved on to a second draft. Typing something up from hand-written ensures that I read through the chapters themselves as a cohesive unit, which allows me to better focus on continuity and errors such as too many questions or the same word used too many times. That way, by the time I’m getting to the edits stage I’m capable of moving on to the bigger thematic edits- does this story element work, would that character really do that, what details need to be added, which ones needs to be tightened, etc.- so that by the time that I have a third draft I’m capable of moving straight into the nit-picky details and polishing the entire thing. I prefer only having to do two drafts through the typed method- in that way, I only have to print once or twice, rather than three or four times. Considering my manuscripts are pretty hefty, and I am no longer of capable of sacrificing my university printer bucks to print them out, economizing the process is pretty important. So, readers: what do you prefer? Do you hand-write, then type? Do you type on a typical word processor like Microsoft Word? Do you use a specialized program like Scrivener? An online-posting community like Webook or Wattpad? (I myself use Webook for beta reads). How many drafts do you kick out? When I tell people that I’m an author, one of the first questions that inevitably gets asked is ‘How much money do you make with that?’ or the comment of, ‘Look at you, rolling in the big bucks’. I refuse to answer either of them, as I think that a person’s income is a very personal thing and is honestly nobody’s business but my own and my family’s. I will state, however, that this early on in my career, I am most certainly not ‘rolling in the big bucks’. At this stage of my writing, royalty checks are less income than they are very nice, extremely appreciated bonuses that I am very, very proud of. They do not, and probably will not for some time, give me the financial space in which to quit my day jobs. Which I’m actually perfectly okay with. Not ecstatic about, by any means, but okay with. By my last semester of college, I was working four jobs- nanny, sales associate, sacristan and online editor of my school’s newspaper. Throughout my college career, I had also been an admin assistant for a real estate company, a desk assistant, a laundrywoman and a retreat-leader. Some of these jobs paid better than others, some of them paid less but I enjoyed them more, some of them paid best and were the most enjoyable but offered the least amount of hours, some offered good hours but below-living-wage pay. Some I could write at, some I couldn’t. Some had coworkers I enjoyed, some didn’t. I wouldn’t trade any of those experiences for a second. Now that I’m graduated and officially an adult by societal standards, I now have two jobs, in retail and nannying (though I just applied for a third, fingers crossed, as the retail job has cut back so severely on hours that I wouldn’t be able to pay my bills). Though people have asked me how I find time to write with all of this work to do, I find that I honestly couldn’t write without it. On its base level, working (usually) gives me the sense of security that I need in order to be writing my novels and short stories without having to worry about having a roof over my head tomorrow, and I am grateful for that. It also gives me the peace of knowing that, should I need a job in the future to support my kids because I’m still not making enough through writing, I have experience on my resume from this time in my life that I can use as a cushion no matter what is in store for me in the future. 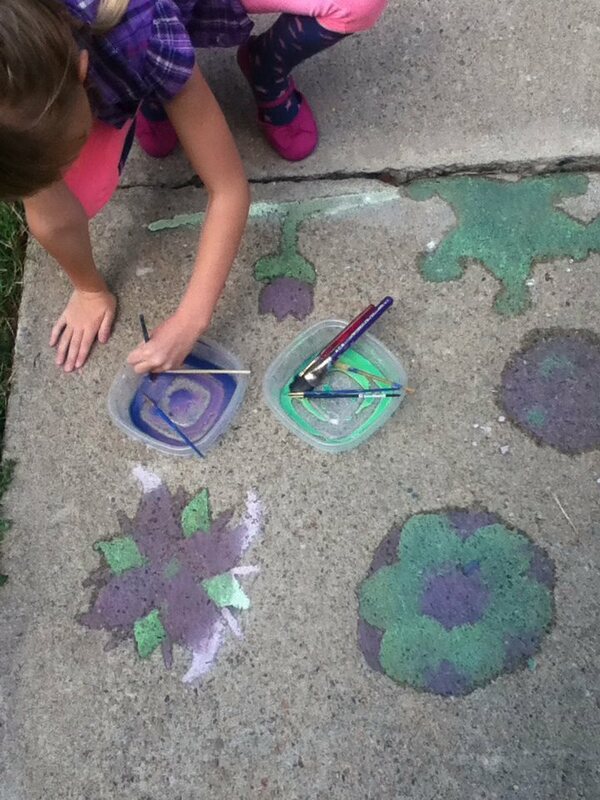 Homemade sidewalk chalk painting with one of the girls I nanny. I am also lucky enough to have chosen my specific jobs well. Coming from a large Irish family, where I tended to be the most responsible and also the most willing to be around the children, I started nannying because I thought it would be the easiest fit for me. Where this normally turns into a ‘and I was wrong’ twist, I actually found that I had been entirely right. Sure, watching children for a living isn’t always ‘fun’- the children aren’t always angels, even if they are on the whole, and even when they are being good, it can be extremely stressful being responsible for another human being’s wellbeing, happiness, and safety (surprise, surprise). However, after being with the family who hired me for almost a year now I can say that I would personally be happy if I never published another novel and just focused on becoming a childcare provider. I love being a nanny. And even as a writer, I think nothing short of me having my own family will stop me from being one. Being a nanny has been an unexpected blessing for my writing, as I’ve written about on my poetry blog regarding hanging around kids, and even on the days when I don’t have time to sit and write while the girls are doing their homework, just being around them gives me the mental space in order to keep my creative gears going. 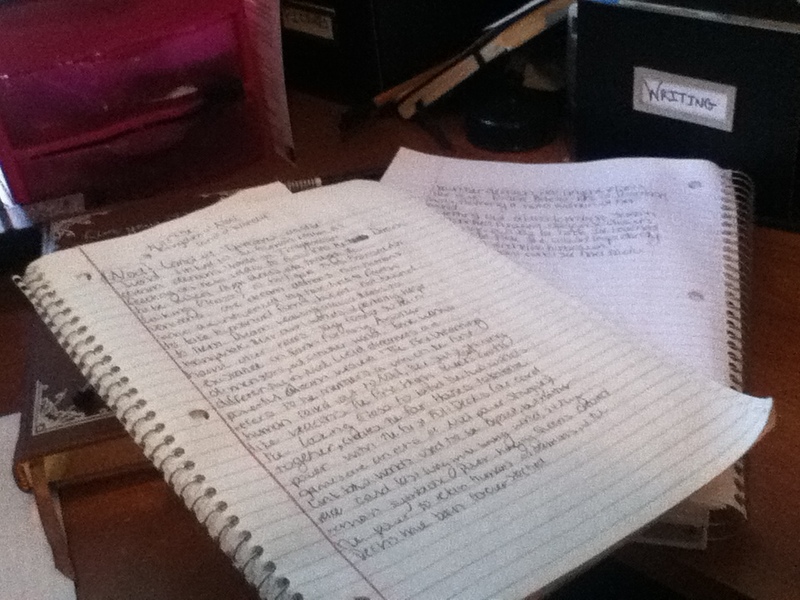 Even though I personally hate retail work, I can also admit that it too has helped me become a better writer. Even in my smaller, 4-5 hour shifts I am exposed to a plethora of so many different people of varying cultures, languages, types of dress, socioeconomic statuses, gender performances, and temperments. Some of them are my coworkers who I have to see every day, reacting to the same situations I am. Some of them are customers who try to fit their entire life story into the three minutes I have them stalled at the cash register. Catch them on good days, catch them on bad days, it doesn’t matter: people say just the most fascinating things to the cashiers that they don’t even tend to see as ‘people’ than they see them as nameless blanks filling a role. Some of them are horribly offensive, some of them are awe-inspiring, some ridiculous and some boring people who view themselves as heroes of their own worlds. I’d like to think that this experience has and will continue to make me more concious of my character development- without working retail, I don’t think I would be so intimately aware of the myriad kinds of people that exist in my own community, much less the potential people that can populate the worlds I create myself. So no, being a published author has not allowed me to quit my day-job. But at this point in my life, why should I? Followers: What kinds of jobs have you benefited from the most? Where have you met an author working in an unexpected place? What kind of job do you think would work best with your writing schedule? Tomorrow at 3:45 Eastern time, I will be calling in to Book Discussion hosted by Fran Lewis, as part of her ‘Mystery Thursday’ segment. 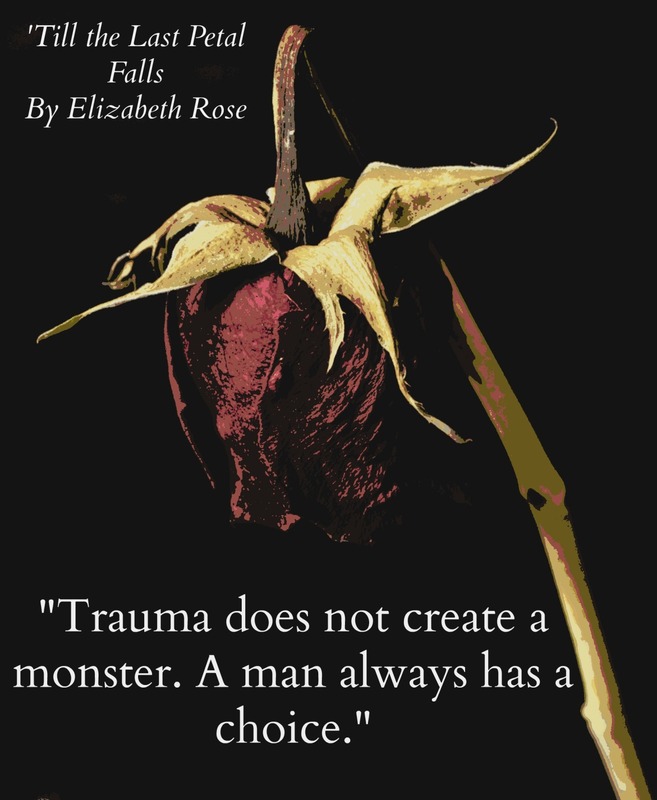 Myself and a couple of other authors will be discussing how to create suspense and thrill in fiction, as well as answering questions that you can write in in the open chat room.